First photos of puppies in Tsaani's Facebook-page: here. 31.7.2018: Vilkku has been in ultrasound and she IS pregnant! Puppies expected at the end of August/start of September! 30.6.2018: Vilkku has been mated, hope we have puppies! 16.6.2018: Vilkku's heat has begun! 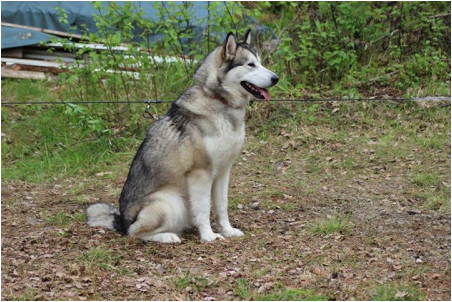 sire: FI CH SE CG Neatut Kadluk KVK1 REK1 "Jyry"
dam: FI CH NordJW-09 Cahppes Miss Qrendi KVK1 REK1 "Yona"
is 3 years old, healthy and working estonian male, which is social and open both people and other dogs. Folki is energetic, happy and easy. He works on his owner, Ulvi's team in different places, also in lead with other male, Rafa. Folki is near ideal size, height approx. 64 cm, weight 38 kg. He as good proportions, good topline, suitable bones, right bite, good paws and beautiful head. Folki moves beautifully and typey. 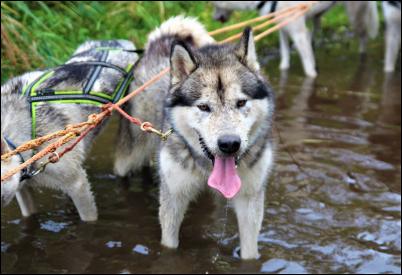 Folki has been tested of coat lenght and he is long coat gene carrier, but his coat is normal and coarse. His tail is little bit too tight. Folki has healthy eyes, hips A/A and elbows are 0/0. Polyneuropathy-genetest is clear: healthy, non-carrier. 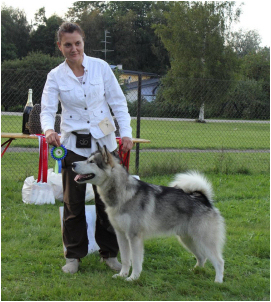 Folki has 2 x JuniorCAC and 2017 Estonian specialty show BM3 and CAC from breeder judge, Anna Albrigo. 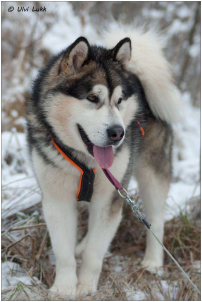 Folki's info in Estonia kennel union's database here. is very energetic and happy, even a little bit funny girl, whose tail stops never wagging. She is open, social, happy and loves all people. Vilkku is also smart and learns new things very fast. 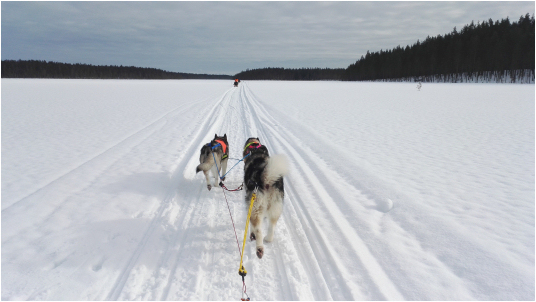 Vilkku loves speed, like her mom, Yona! She runs, speeds up and almost flies when running free - just for her own fun. Vilkku has also proved to be very active, brisk and strong worker, who keeps up the pace in team. Vilkku runs usually in co-lead in our team, mostly in 8-team, but she can also work alone in front of kick-bike, pulka etc. Vilkku is basic malamute as her structure, everything on it's place, as it should be. Vilkku has right bite, beautiful head and expression - good angulations, right proportions and she moves typically for the breed. Vilkku has little bit long loin, paws could be little bit better and maybe little bit more bones. Vilkku has been checked healthy in hips, elbows, back and eyes. 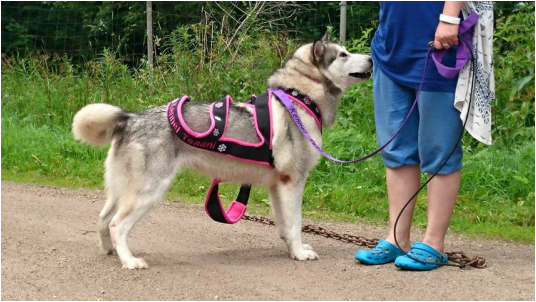 Vilkku is also dna-tested of long coat gene and she has normal coat and is non-carrier. Vilkku don't carry PN-gene, she is clear by parentage. 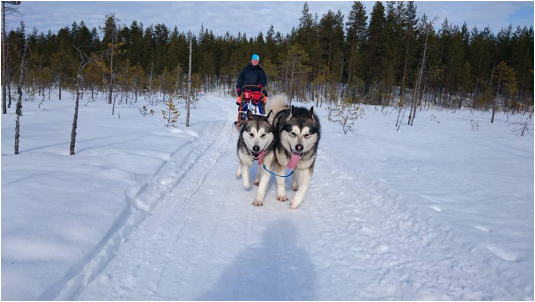 Vilkku has official sled dog test result REK3 from year's 2016 Ruunaa Race, Finnish championship Mid-distance race. 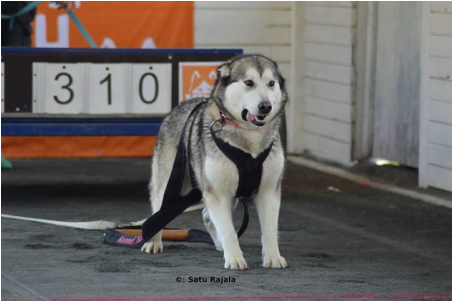 Vilkku has also done Alaskan malamute's own working result, Weight Pull-test in first try and got official result KVK1. Vilkku has also competed actively in FWPA's weight pull competitions with good results. 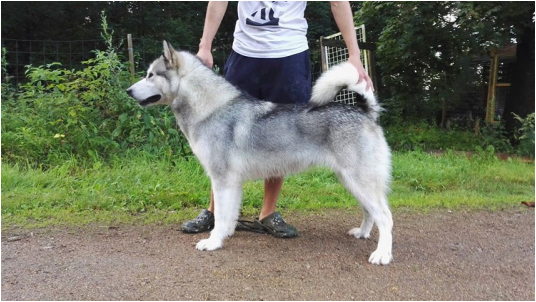 in this litter I'll hope to have excellent temperaments, energetic, working, happy and breed typey malamutes for both work and show. There can't become long-coated puppies and polyneuropathy sick or carriers in this litter. 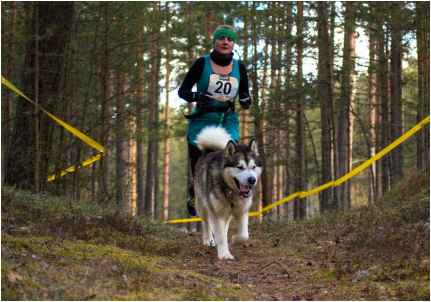 Vilkku's mom, Yona is our pack's leader and from age 8 months to 8 years also leader of our team and our foundation female. 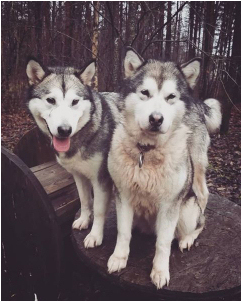 We have 4 of Yona's offsprings living with us, Vilkku's brother Lassi, and Kayitah and Siida from Yona's first litter with Timi (Quinault's Quiet Riot). They all has been proved their working abilities in our team many times and they all are very energetic, open and happy. 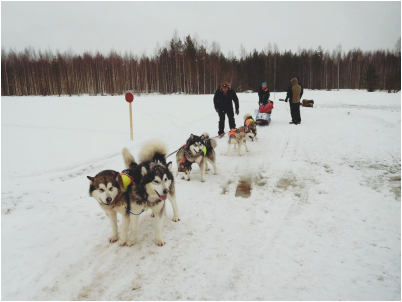 Vilkku's and Lassi's sister, Malina is also running actively in team and competes in weight pull also with very good results. 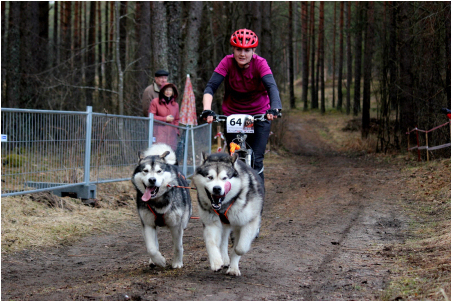 Folki's mom, Himma is also our Weeko's mom from litter with Leevi. Weeko is also working in our team and despite her young age, often in lead also. Puppies will be sold only to active homes, not in apartment house. Our puppies will leave to their new homes earliest at the age of 8 weeks. They are registered to FCI-register, they have been checked by the veterinarian and they are microchipped. Buyer gets puppy info package with covering feeding, health and puppy training instructions. 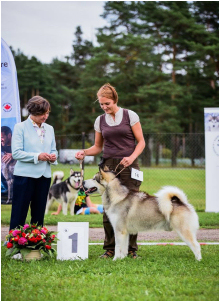 Package includes also their pedigree, info about different activies and malamute's breed standard. Puppy will get also food package of dog food they've been eating at breeder's home. 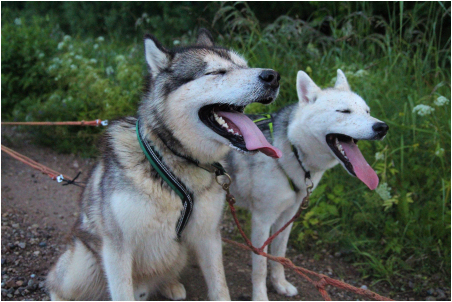 If puppy owner wants, I will also join them in Finnish Alaskan Malamute Club member for 1 year. I hope to meet all puppy buyers personly before purchase/selling decision, so we can make sure, that malamute is right breed for you. I'll do my best to find just the right, loving forever home for every puppy. 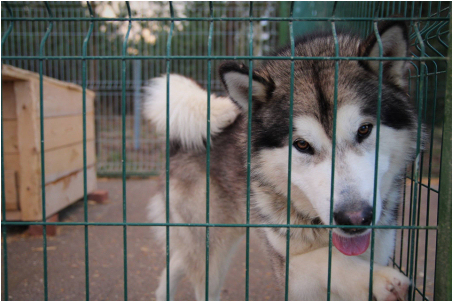 Malamute's expected age is quite high and you should never take a puppy impulsively. I hope that I can follow up puppies life in their new homes. You can contact me any time, you can ask me questions and I'll try to help out in every situation. It would be very nice to be part of happy moments also. 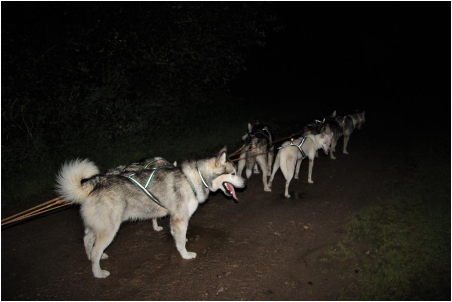 If these things aren't problem for you, you are most welcome to contact us, visit us and meet our malamutes. 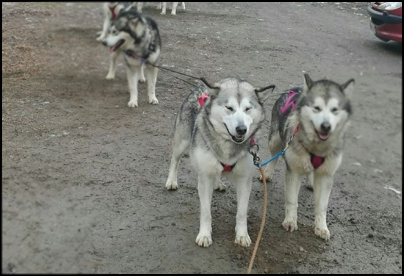 Vilkku (left) with her mom, Yona. Folki's mom Himma (left.) and granddad Hatu.